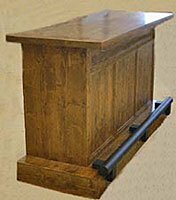 The American Prairie Collection is designed to offer our clients another choice in custom, rustic, game room furniture. This new group will be built from Knotty Alder, a wood that works well for rustic home furnishings. This American Prairie Collection incorporates clean, simple lines, with a naturally distressed look, allowing the pieces to coordinate with several styles of decor, from rustic to contemporary. Initially, this collection was conceived to offer a simple, basic design that could be customized by our clients in a variety of ways with the addition of decorative panels, metal hardware and other trim details. 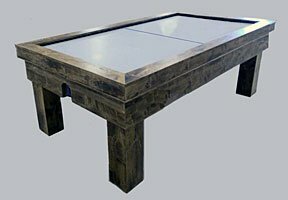 While some clients prefer the basic pieces without additional details, others have the option of creating a unique game table to fit their particular style. The American Prairie Collection began as an idea several months ago. 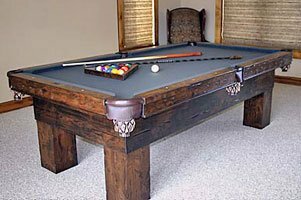 The Drawknife staff had been thinking about a new line that would offer dealers and interior designers a new rustic look in game room furniture. 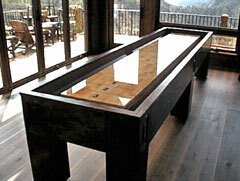 About that time we were asked to build a 12′ shuffleboard table for a designer. The request was for a rustic table without the log look. 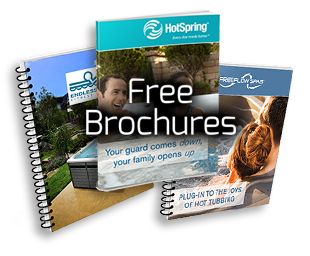 We sent the firm the concept sheets we had been working with, and we were able to develop and refine the design to meet their specifications. We had already planned to build the new line using Knotty Alder, a popular wood used for doors and cabinets. Its variety of knots and interesting grain patterns make it a good choice for game furniture, as well. Initially, the new line was conceived to provide a simple, basic design that could be customized by our clients in a variety of ways with the addition of trim panels and other details. 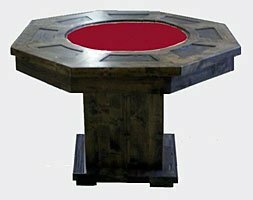 From a basic model, clients are offered the opportunity to add a variety of trim details to the body, sides and other parts of a game table to create a unique piece for their home. This was achieved in the shuffleboard table by the addition of trim panels to the corners and sides of the body of the table. Drawknife Billiards is pleased to announce that our 12′ American Prairie Shuffleboard Table has been awarded the ADEX Platinum Award for Design. The shuffleboard table is the initial item built in our newly introduced American Prairie Collection, inaugurated in Fall, 2012. ADEX stands for Awards for Design Excellence and is the largest and most prestigious awards program for product & project design in the A&D industry. Design Journal, the international trade publication for interior designers, architects and facility managers since 1988 is the proud sponsor of the ADEX Awards. The items pictured below are examples of the American Prairie Basic style, with simple clean lines. 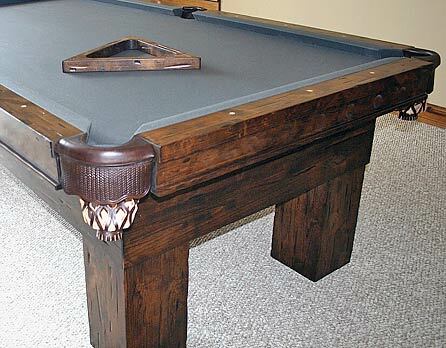 The billiard tables can be coordinated with accessories: a ball triangle made from the same distressed Knotty Alder as the table and cue stand, as well as a custom bridgestick fashioned from wrought iron, with a handle stained to match the other pieces. 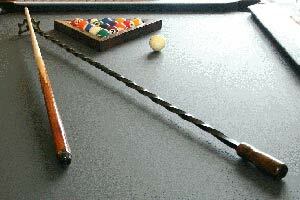 The matching cue stand is also built in the basic style.